As promised, today I have a giveaway for you guys! Thanks to the awesome Kelly from Stacked, I'm offering up TWO copies of THIS IS NOT A TEST (December's Read-Along Pick)! ONE is open to participants AND non-participants (although, if you win and want to participate that's awesome as well)! ONE is open to Read-Along participants ONLY. The giveaway will last about two weeks, ending on November 15th! 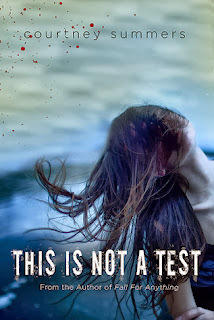 THIS IS NOT A TEST is, quite possibly, my favorite book in this world favorite (and has one of my favorite covers). Which, is saying a lot. It is not your typical zombie book, but a heart-breaking, truthful story about what it's like to live. If you want to hear more of my thoughts, check out my review here. Good luck, everyone! And thanks again Kelly! Wow! This looks like a great read! I've always been wanting to read this book. It feels good to read another story about zombies. yes, I think i could. i am pretty strong in the running and guns department. i go hunting sometimes, and im great with a bow... Ive played archery since fifth grade. I think I'd survive for at least awhile if there were a zombie apocalypse. I'd like to think I'm pretty badass. it would definitely be a challenge. i'm not sure i'd want to live in a world like that, though. No, I don't think so lol Maybe at first but that's it. I already bought this for the library where I work, but I'd love to have a copy for myself! Yay for badassery! Oh, oops, didn't answer the question. I'm going to say yes to surviving the zombie apocalypse, because I have awesome friends and a vague plan and am generally lucky. I honestly don't think that I could survive a zombie apocalypse, unless i had fictional characters with me. I probably would not survive a zombie apocalypse, because I am scared of many things, one of those things being zombie apocalypses. That being said, I don't do well when I am scared. I don't think I could survive a zombie apocalypse at all! I really love movies and books about zombies but I don't think that I could survive a zombie apocalypse. I would be the first to be eaten in the zombie apocalypse. I'm highly unprepared, should this ever happen. I would definitely not have survived a zombie apocalypse, I'm sooooooooo afraid of zombies I would be paralyzed when meeting one and would have been eaten at the first occasion I'd have gotten !! Thank you so much for this great giveaway!! I want to say I'd survive a zombie apocalypse,but lbr not true haha. I'm not a runner,I'd be dead in 5 secs. I think I would survive but only by myself. In all honesty, I would not survive a zombie apocalypse. I would probably be the first one to die. lol.